Here is how to install / use systemd in Ubuntu 12.04. On my system my boot time went from 9 seconds to five seconds. The difference for you could be even better. This process does not work on any other Ubuntu release besides 12.04. The systemd version that is found in this ppa is outdated however you can still use it for testing purposes. Update: After using this for a few days I can safely say that you must know how to rescue your system should anything happen (and it will), I will therefore make these instructions geared towards those who know what they are doing. 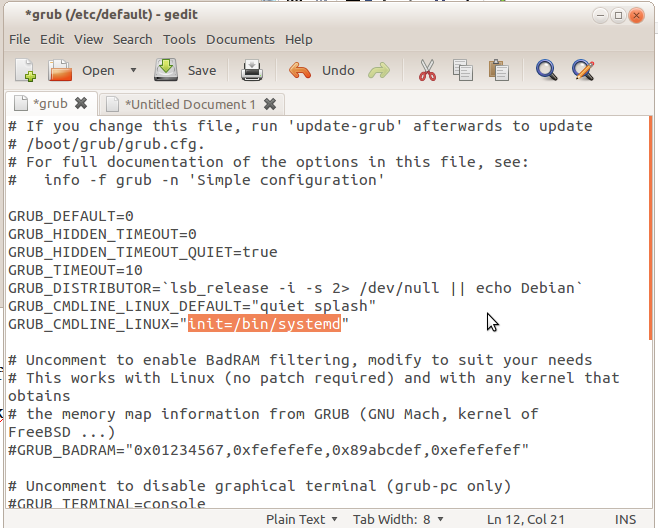 then update grub and reboot to see if all went as it should. If everything worked then you shouldn't really notice much difference besides maybe a faster boot and other things *possibly* starting faster. If your PC fails to boot for any reason just edit grub before your system starts booting the OS and remove the "init=/bin/systemd". Once booted then re-edit the grub config file as you did above but this time remove the line you added above. I purposely left out certain commands, see my "update" above explaining why. I did the same as you mention above on ubuntu server 12.04 and it works. But i don't know how to init the networking. Can you show me some tips ?